In a recent application, a customer was looking to move small parts into a single file line so that a robot could pick the parts up one at a time and move them to the next machine. The customer will manually dump the parts onto this recirculating conveyor, a system using two conveyors moving in opposite directions and a piece of guiding to direct parts towards an opening where they enter single file. A recirculating conveyor was used because it allows the product to accumulate while reducing back pressure and product damage and help prevent product jams. At the opening, there is a UHMW block that will not allow the product to flow through unless it is in the correct orientation. The block also will help change the parts to the correct the orientation by knocking them over if they are standing on their side. At the end of the single file line, there is a pneumatic “v-block” that moves the parts one at a time into position for a robot to pick them up and move them to the next machine. 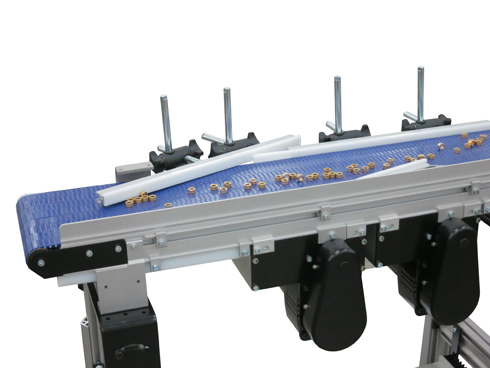 Learn more about Product Accumulation Conveyors.